Who Belongs to the Dead Plant Society? You are here: Home / Home Page / Who Belongs to the Dead Plant Society? How often do you get to kill something and feel good about it? It’s good anger management therapy! There we were, hiking up Stone Mountain, near Atlanta, going through one of the smallish wooded areas (most of it is bare granite). When what to my wondering eyes did appear, but a bunch of bittersweet….oh, my dear! That would be oriental bittersweet, of course, (Celastrus orbiculatus). Nothing excites a Non-native Invasives Geek like a small, removeable patch of a bad plant. It covered a mere 2′ or so in diameter, and so I just started pulling. Carefully, so as to not leave anything behind in the soil. My husband, used to this, sighed and put his hands in his pockets. “It’ll just take a minute! It’s a small patch!” I reassured him. Again. So, here’s the bittersweet. 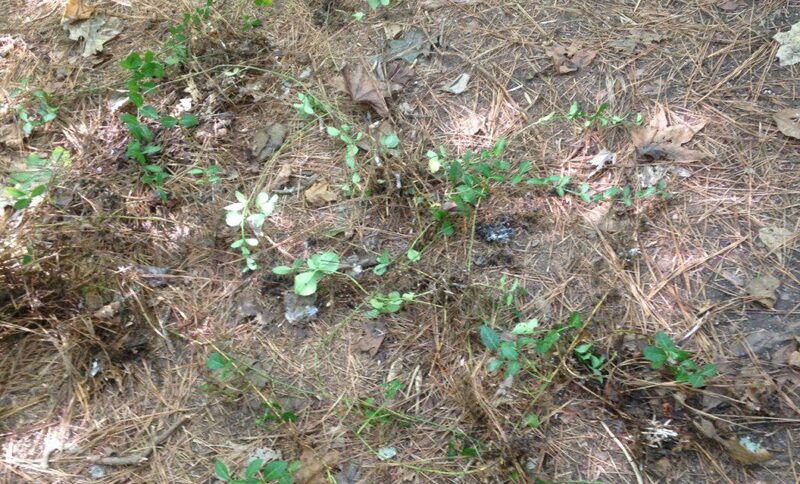 I left it in the center of the trail…figured that if another native plant person saw it, they would know to keep their own eyes out for more. At least that’s my theory. If it was garlic mustard, it would’ve gone with me to the car and been thrown away properly. All in a day’s work.